Do you like books that bring history to life? Then you’ll love The Bride’s Trunk, because it’s a page-turner, a true story of love and reconciliation in the aftermath of the Second World War. Beautifully told, it stays with you long after the last page is sadly turned. Imagine you must decide the rest of your life in one evening. This is the momentous choice facing Minny, a young woman who has grown up in Nazi Germany. Her decision made, she leaves Germany on a bitterly cold morning in December 1946 and travels to England to marry Jim, a British Intelligence Corps soldier in the Allied armies that defeated the Nazi regime in 1945 and occupied the devastated nation. She has survived British and American bombs and witnessed the destruction of Aachen, her ancient and beautiful city. How will a German woman cope in austere post-war Britain, where she is still regarded as the enemy? 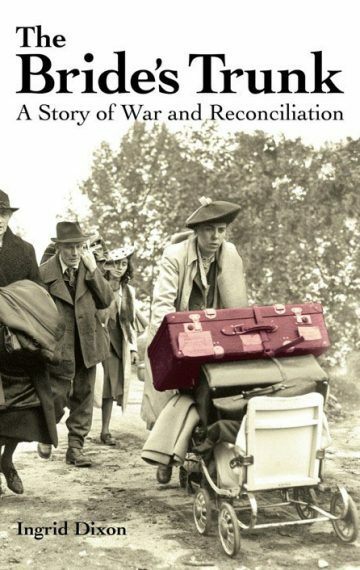 Illustrated with almost 100 images and original documents, The Bride’s Trunk describes the adventures of an unremarkable piece of luggage and three generations of its owners, whose journeys across Europe are determined by the turbulent events of twentieth century history. “Loved it!” A recent 5* review. Now join other readers who have been gripped by this captivating true story! Of course, you can also support your local book store and order The Bride’s Trunk there.